^ An excellent list of patch notes. Aye, I agree with you. Though I find many of the new features not interesting, the developers made this patch / upgrade done with feedback and wishes from the community. Something that can't be said from RCTW. Fireworks - a new type of triggerable object! Painted Wooden Coasters - White Woody's are now available! This new option allows players to create realistic coasters that pass through the station multiple times, in either direction! Triggered Speakers now support user content. Add your own sound effects the same way you do with Music Speakers! Iron Claw - The Iron Claw is a classic pendulum ride that’s been very popular in many parks around the globe. This extreme thrill ride holds up to 32 guests at a time and swings them 65 feet in the air while the cabin continuously spins. The sensations experiences are zero to heavy downward g-forces as the guests are flung in all directions and almost completely upside down. Sky Watcher - The Sky watcher is a large observation tower that elevates your guests to 138m into the air to give the most impressive vista of your parks and the rotating cabin offers amazing panoramic views. The movement is graceful and is suitable for all ages. The structure is and elegant and beautiful combination of glass and steel and enhanced with a beautiful lighting arrangement this will give your park an iconic landmark for your guests to wonder at. This ride seats up to 60 guests at a time making it the highest capacity of any ride currently in game. Black Out - The Blackout is an extreme inverting swing-ship, and has been inspired by the classic Looping Starship. This ride harkens back to the golden age of when the space race was flourishing. With a capacity to hold up to 50 guests and standing at 22 meters it’s a great major ride for your parks. Power Up - The Power-up is a compact coaster ideal for squeezing into those tight spaces in your park. The train design is very open to offer maximum thrills and exposure to the elements. A vertical lift that takes the train uphill at 90 degrees and then the car then turns another 90 degrees upside down and is released into a terrifying plummet through a heart line roll down into a vertical drop and back through the station, back up the chain-lift again where it the rolls backwards through the station again a couple of times until it’s caught and lowered backwards into the station. A short but brutal ride guaranteed to scare the wits out of your guests. Viper One - The Viper One up is a multi launch, twisted impulse, LIM shuttle coaster that consists of two large towering supports that hold up a 66m inline-roll at each end. As the coaster passes through the station the train get hurled up further up the track with each run until it almost reaches the top of each tower and giving the sensation the the train is going to fly off the end of the track. Gnarler - The Gnarler is a new wooden coaster car to help celebrate the addition of painted wooden supports. The train is adds a more modern wooden coaster train design tom the traditional wooden coasters family. The train chassis are incredibly detailed with stylish and beautifully crafted interior and unique lead car. De-Gen and Bolt - Something often requested by the Planet Coaster community was to have the sit-down boomerang coaster car (Trident) to appear on the ‘looping coaster track’ (The American Arrow) and visa-versa. We not only did this by creating two new coasters but we also gave them an upgrade with a new lick of paint and some minor cosmetic tweaks and they look beautiful. Goldmine Tower - Some poor fella bought this mine from a prospector, and took out some big loans to pay for it. Turns out it was a scam. The varmint had salted the mine! Now he’s trying to turn it into a tourist attraction with fireworks and Old West-style streets, but it’s not doing as well as he hoped and he needs your help. Miss Elly's Diner - Miss Elly's Diner has some great facilities, including a big wooden coaster for a spot of excitement! But its remote location means it doesn’t see many visitors, and its potential isn’t being realised. Can you build on this location and draw in the crowds? Starship Hanger - They filmed some pretty famous movies out here in the desert. It kind of looks like Mars, don’t it. The place isn’t much in demand any more – it’s all CGI these days – but the company doesn’t want to let it go. They want you to turn it into a theme park instead! Added time controls to the blueprint thumbnail screen. Capture your creations in their best light! 2 new Uncle Sam and Liberty hats for avatars. Guests can purchase these new hats from Hats Fantastic shops too! 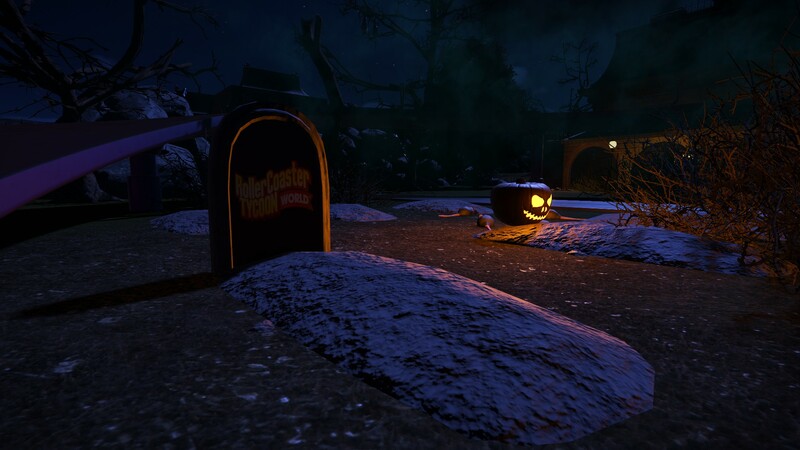 Planet Coaster update 1.3.8: Spooky Pack DLC and more! Announcement on the Planet Coaster forums. Thanks to someone on Reddit for creating this interesting scene. I forgot RCTW even existed until I see an email saying about the change in devs. Been playing Planet Coaster for the best part of the year, even bought a high end PC to play it on. I doubt I would return to RCTW for the fact being that it’s a dreadful game, remained a dreadful game and will always remain a dreadful game. Breaking news today from the Planet Coaster forums: Frontier is going to release a 'Thememaker's Toolkit' for Planet Coaster later this year, enabling players to add UGC scenery to the game. This includes sharing on the Steam Workshop.